We met refraction during the National 5 course. At Higher level, we are interested in the relationship between the angles of incidence θi and refraction θr. Read more about Snells’s law here. 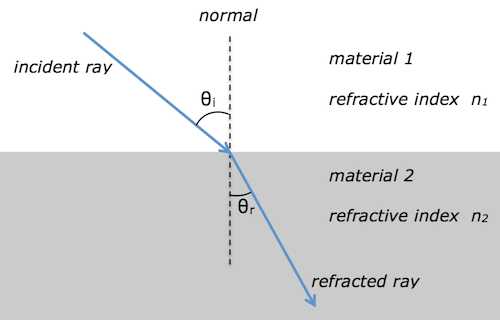 Here are some applications of total internal reflection here. You can test your knowledge of refraction with this interactive simulation. I have attached a pdf with some notes and questions on refraction, total internal reflection and critical angle.